Blood Money – Hazard River Series – Competition! Imagine you are wondering along Hazard River, minding your own business when you stumble across a bag full of money! Have all of Jack’s dreams come true? Knowing Jack the way I do from his other fantastic adventures, I know it is pretty unlikely that things go the way he plans. Blood money is another fast paced, riveting adventure which takes you out of your comfort zone and sticks you in the path of some unsavoury types. Even more unsavoury then his little brother AKA The Stink Collector. J.E. Fison has the amazing ability to take even the most reluctant reader away with their imagination, on a whirlwind ride riddled with action and hilarity, suspense and things that make your skin crawl. If I were to recommend only one series this would be the one I would pick! Collect them all, get them before they run out of bookmarks and stickers. If you want to know more about any of the other Hazard River books buzz over to www.hazardriver.com or our very own Bug in a Book Author interview with Julie Fison. Julie is available for book signings, interviews and blogs too. 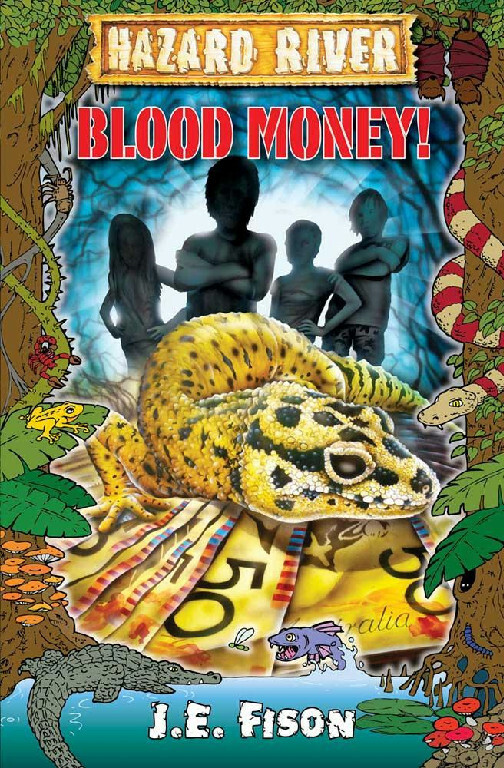 To win a signed copy of Blood Money and Toads Revenge leave a comment below telling us where you would like to go on an adventure and which animal you would like to meet along the way. Where will Jack Wilde find himself next? I can’t wait to find out!